I recently received an email from a dear cousin asking for prayers for a couple at her church. My cousin included The Prayer of Healing that was written by Father Larry Hess from the Lehigh Valley. Also, another good friend asked for prayers for one of her friend’s family members going through some recurring problems. Initially, I was going to post right away on Facebook asking for those prayers but something intrigued me about Father Hess and I wanted to learn more about him and his Prayer of Healing. As a young priest, Father Hess was involved in hospital ministry and known for his healing prayers said at each patient’s bedside. He would pray with each of the patients individually and spontaneously. The more he prayed with them the more he formalized his prayer and he wrote it down. He wrote it down he said, “So I wouldn’t forget it”. Father would also serve for many years at Notre Dame High School, Muhlenberg College, Cedar Crest College and Kutztown University. Many came to feel as one of God’s unique children because of Father’s kindness and patience. He would later be pastor of Our Lady of Good Counsel in Bangor, PA and served at St. Vincent de Paul Mission in Portland, PA. Father’s last assignment was as Pastor of St. Anthony of Padua, in his hometown of Reading, in the Millmont neighborhood. Father was the 8th Pastor of St. Anthony and he oversaw the renovations of the church and school in anticipation of their 100th Anniversary in April, 2014. Father Hess would not live to see it as he passed away in February, 2014 at the young age of 63. He had been a priest for 35 years. He had such a personality that others were drawn to him and, through him, to Jesus. Father Hess was also a dynamic preacher, too! Writing down his prayer enabled Father to make prayers cards for those he ministered to and to others who heard about his healing prayer. At the time of his death over 10,000 of his prayer cards were being asked for here in the US as well as other countries. His legacy came to be that he was “The Priest of the Holy Card”. I tried to find out if the holy cards were still available. It took some real detective work. As we know, churches close and merge, and I thought I wouldn’t learn the answer to that question. But through comments on a web post, I learned that Our Lady of Good Counsel and St. Vincent de Paul Mission Church merged. I called the rectory and their automated response asked if you were looking for the holy cards to contact David Rugh. I called David Rugh to learn that he is the nephew of Father Hess and the family has taken over the sale and distribution of these holy cards. Now called “Heavenly Father Card” as those are the beginning words of Father’s prayer, you can order them through their website, www.heavenlyfathercard.org. They also have cd’s and dvd’s of Father’s talks and sermons. They ask for modest donations to cover shipping and handling. Heavenly Father Cards are available in Spanish, too. You can get prayer cards that are for you to say for yourself or prayer cards for someone you are praying for their healing. Well, we will be ordering cards as I know that those we serve would welcome them in a special way. We have much to pray for. 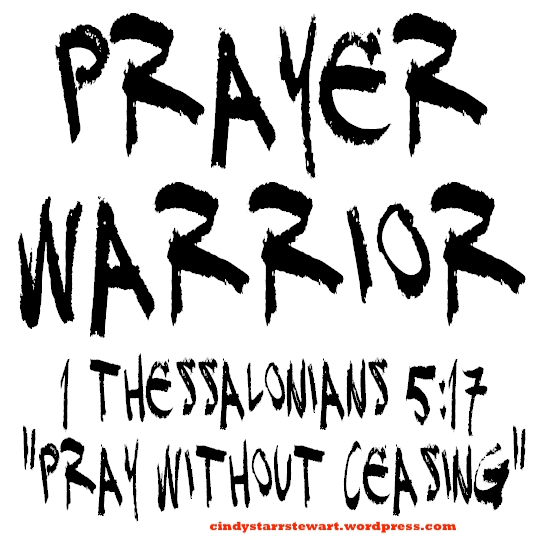 We are prayer warriors, too! Here is Father Hess’s Prayer of Healing. When praying this prayer, just replace the “I” words with the name or intention for whomever you are praying. God will know who you mean. “Heavenly Father, I call on you right now in a special way. It is through your power that I was created. Every breath I take, every morning I wake and every moment of every hour, I live under your power. For if you created me from nothing, you can certainly re-create me. Fill me with the healing power of your spirit. Cast out anything that should not be in me. Mend what is broken. Root out any unproductive cells. Open up any blocked arteries or veins and rebuild any damaged areas. Remove all inflammation and cleanse any infection. Let the warmth of your healing love pass through my body to make new any unhealthy areas so that my body will function the way you created it to function. And Father, restore me to full health in mind, body and spirit, so I may serve you the rest of my life. Please pray for my cousin’s friends and my friend’s family member. And, say a prayer for Father Hess, too! Thank you and God bless you! All are invited and welcome to our Ecumenical Prayer Services on Wednesday evenings, February 17 – March 23, 2016. 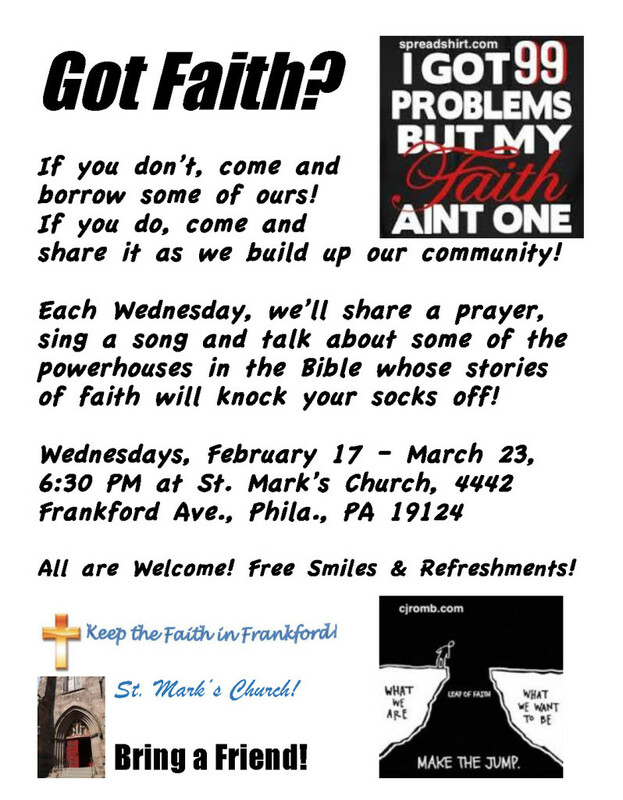 Sponsored by Keep the Faith in Frankford and held at St. Mark’s Church, 4442 Frankford Avenue, beginning at 6:30 PM! Join us for an opportunity to renew your soul with the Word and your body with cake and coffee!! Bring a friend or two! Can We Be People of La Mancha? God never asks us to do anything easy and neither does the Pope with his belief of mercy for all. Every time I want to get angry and ask for God’s wrath and mighty justice, I struggle with having compassion and mercy towards Archbishop Chaput and Father Higgins for their actions in closing our two Churches in Frankford. Their ease in refusing to see the hurt, the damage done to the faith and to the faithful, not just in Frankford, but throughout the Archdiocese truly boggles my mind. I choose God always so I choose mercy. Whether your Church remained open, was closed and merged, or now, partnered with another parish, we are all affected as we are all members of the “One Body of Christ”. I seek forgiveness from all those whose parishes started closing in the struggling urban areas of our city starting in back in the late 1980’s and 1990’s. I’m sure I felt sadness as my Mother’s beloved parish, Our Lady of Holy Souls, went through many transitions, but is still alive as Our Lady of Hope. Where was my voice in outcry at the beginning of the abandonment of our city? If you haven’t read this post, “Dooming Us To Repeat History” by David Harris, please take the time and inform yourselves that this effort, especially closing Churches within city boundaries, began long ago. So many people that I’ve met have told me they’ve attended Churches throughout our metropolitan area that were closed, merged and closed again. The sadness is real and did this have to be? Well, that’s why we need to be the people of La Mancha? 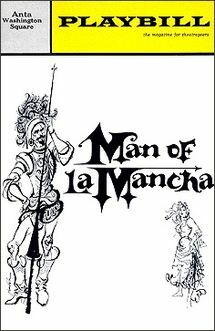 Who are the people of La Mancha? You and I should consider ourselves people of La Mancha! We are very real – we believe that we can affect change – and those of us who opposed the severely-flawed Area Parish Pastoral Planning Process can take heart today that we did, ultimately, affect change for those parishes undergoing the process after us. There’s a new model the Archdiocese is using, “Partner Parishes” where a Church is not closed but partnered with another nearby. The “Partner Parishes” share a Pastor, staff and combine their Parish Councils. However, since each Church remains a Parish, they each have their own Finance Council. It seems this model has already been used in other Dioceses – why was Philadelphia so slow to adopt it? 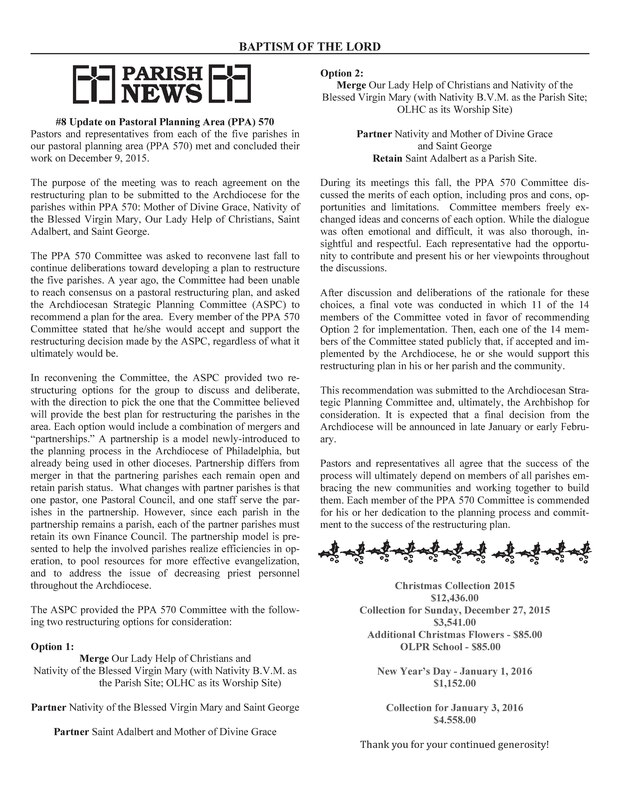 David Harris shared with me earlier this week, the January 10, 2016 Weekly Bulletin from Nativity of the Blessed Virgin Mary regarding the outcome for the five Port Richmond parishes in PPA 570. You may remember they were granted additional time last year to more fully come to a consensus on their futures. (I checked the other parish websites but the weekly bulletin for this week was not yet posted as of this writing.) You can read their decisions that have been submitted to the Archdiocesan Strategic Planning Committee and the Archbishop and the explanation of how they arrived at them pictured below here on page 3. Meetings were held to “reach agreement”. For PPA 560 (the faithful in Harrowgate, Frankford and Juniata), the meetings were simply to get it done. When “the Committee was unable to reach consensus”, they were given more time.PPA 570’s experience reflects a real process with invested members treated respectfully and “had the opportunity to contribute and present his or her viewpoints throughout the discussions”. The antithesis of what happened in our process. In PPA 560, we had two Committee meetings and then it was between the Pastors. Father Higgins and the Archdiocese ultimately decided. “Every member of the PPA 570 Committee stated that he/she would accept and support the restructuring decision made by the ASPC, regardless of what it ultimately would be.” The committee members also had to state this later “publicly”. Someone didn’t want trouble after the decisions were made. I went to our archives to see what I was doing when St. Joachim first closed. Take a look here – Keep the Faith in Frankford. As a member of the Transition Team, I “walked the walk” and gave the “new” parish of Holy Innocents the openness they deserved. I attend Holy Innocents but fervently believe that we in Frankford need and are worthy of a weekly Mass. As already explained there is a new, to Philadelphia, “Parish Partnership” model. Who has the courage to “right the unrightable wrongs” to parishes that didn’t have this opportunity for consideration? It only leads us to believe that once the Archdiocese took the assets of the 46 plus Churches closed/merged, they had “righted their financial ship” and didn’t have to take such drastic measures. We believe those drastic measures were never needed had the Archbishop and our hierarchy been straightforward, honest and transparent with us rather than using the guise of the PPA process. Real estate, you’re money is in real estate was the rallying cry of those advising our Archbishop! Partnering allows “each parish in the partnership (to) remain a parish”. 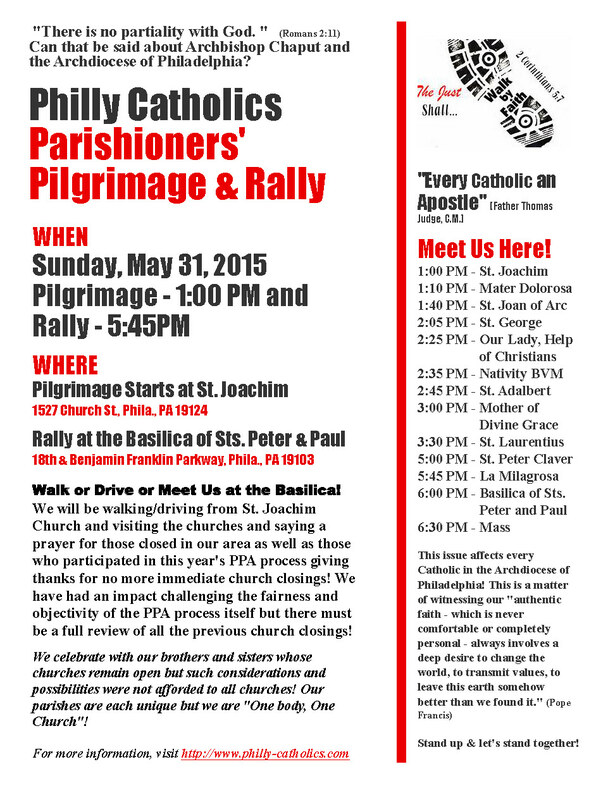 The parish of St. Joachim was suppressed; we’re appealing and believe no decree can suppress a parish community. It doesn’t work that way. We have had a parish in Frankford for over 170 years when 23 men and women first asked for one. We will not let our forebears down. “Pastors and representatives all agree that the success of the process will ultimately depend on members of all parishes embracing the new communities…” Here, we can give you all real advice. Don’t fire people from the Transition Team simply because they used their rights as members of the laity to file a Vatican appeal. Don’t say “the decision is already made and we are not considering any changes.” “Don’t tell your new parishioners that “As long as I’m the Pastor of this parish, nothing is going to change”. Talk about self-fulfilling prophecies! Father Higgins has refused to allow us to use St. Joachim for either private or public worship except for the occasional funeral, wedding and annual Feast Day Mass. 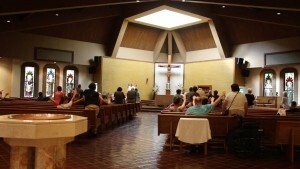 The Congregation of the Clergy in January, 2015 established a precedent in the Diocese of Greensburg in Western Pennsylvania that every Worship Site also have a Mass on their Dedication Day. We wrote and emailed Father Higgins and he ignored us. We have looked to Archbishop Chaput to help us gain justice for Frankford as we have been totally ignored within Holy Innocents. St. Joan of Arc, a Worship Site, has a weekly Mass. We celebrate with our brothers and sisters in Port Richmond and keep all those, especially those of Our Lady Help of Christians in our hearts and prayers. Our Lady, Help of Christians, pray for us! The people of La Mancha are with you all as we continue our efforts (to reopen St. Joachim and once again and to have a weekly Mass in our community) and as you await the final decisions of the Archdiocesan Strategic Planning Committee and the Archbishop in late January or early February. We’re very much aware that such recommendations have not always been so easily accepted. St. Joachim was supposed to stay open, too! The Holy Spirit is with us and our faith is strong! The people of La Mancha still believe that for us things “are impossible but with God, all things are possible” (Matthew 19:26). Here’s a soulful rendition by Luther Vandross of “The Impossible Dream”! Thank you for reading and enjoy! What Does the Future Hold for Holy Innocents? The weekends of November 7/8 and 14/15, members of St. Joachim, Frankford, will distribute information regarding our current efforts to have a weekly Mass said, once again, in our community. You can read our information below which will be translated into Spanish and Vietnamese. Please pray for us and that our efforts are successful! We want to share with you, the parishioners of Holy Innocents, why a weekly Mass in Frankford would help you. The Parish Pastoral Planning Process, which closed both St. Joachim Church and Mater Dolorosa Church in Frankford failed and only created “Roaming Catholics” who don’t support any particular parish. Some of us remained with Holy Innocents while others chose other parishes. But we are all the Body of Christ. When St. Joachim was merged with Holy Innocents, we asked to meet with Archbishop Chaput as Frankford no longer had any Catholic church. Our pastor felt the Parish Pastoral Planning Process should be kept secret and that we should trust him. We had an Oblate priest so we did not depend on an Archdiocesan priest. We were not in debt but our school was rented for several hundred thousand dollars per year and that was ready cash. Since no one would talk with us, we filed a Vatican appeal that is every Catholic’s right under Canon law. That appeal is still pending a review by the Vatican Supreme Court. Father Higgins has been sharing with all of us the “state of the parish” these past few weeks. Father Higgins will explain to us that there is a “need for increased giving”. Recently, on Fox 29 News, Father Higgins said that 4 of his 5 Masses here at Holy Innocents were not well attended. Why not be “creative” as Pope Francis has said and say a Mass in Frankford? We have asked over and over again for the use of St. Joachim for public and private worship and would pay all expenses for the upkeep of the Church and cemetery. We recently submitted a proposal to Father Higgins. We offered to pay for a retired or underutilized priest to say a weekly Mass. Holy Innocents would get the collections thus adding to your coffers. We would come to Holy Innocents and support all activities as well. We would evangelize in Frankford making Holy Innocents even stronger. We’d be active parishioners of the “Inn”. You have all been very welcoming to us. While we are grateful to you and that makes us happy, it’s not the issue. You know how big Frankford is, you may know the problems Frankford struggles with regarding drugs and housing needed for those trying to rehabilitate themselves. It’s not simply a matter of getting on the bus; it’s a matter of worshipping in your own community. A church building is a physical symbol of God’s presence in the community that tells everyone God’s love is for all and there are second chances for everyone. There is no longer a Catholic presence in Frankford except for us, the parishioners who remain to do the work left to us after the Archdiocese abandoned us. There is no pastoral care for those most marginalized by society in Frankford, an area certainly in need of God’s care. Please ask these questions, too, because placing extra burdens on you when all other avenues of possibilities are not explored is not the answer! 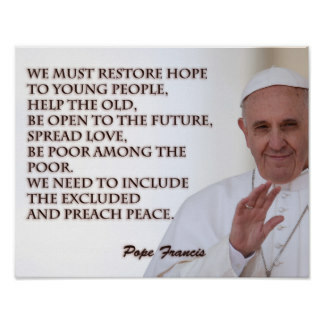 If unity is truly desired and we all want Holy Innocents to thrive, then you must include Frankford! We will be here next weekend, too, in case, you have questions or want to talk further! Please keep us in your prayers and we will pray for you, too! God bless you! Please like us on Facebook at Keep the Faith in Frankford, too! This past Saturday, July 25, 2015, we celebrated the Third Annual Feast Day Mass at St. Joachim in Frankford, Phila., PA since we merged with Holy Innocents Parish, Juniata. 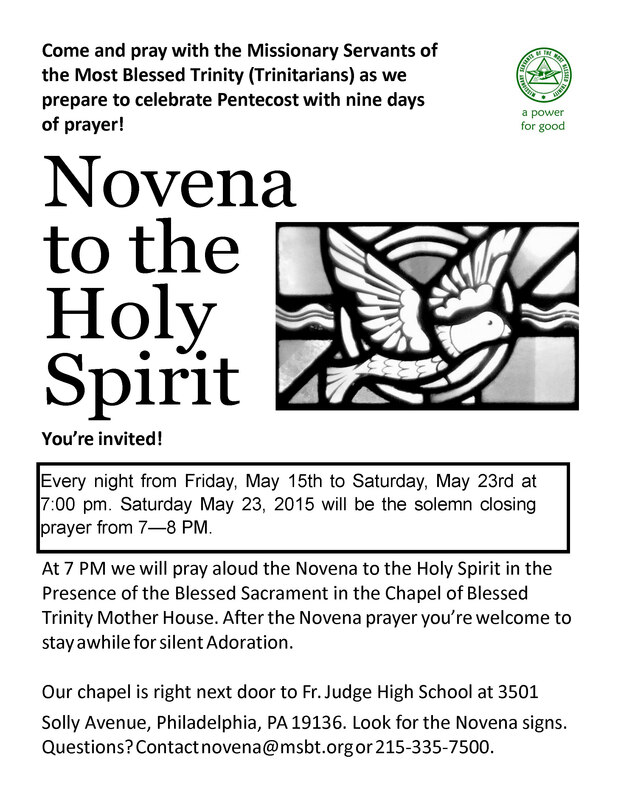 Mater Dolorosa in Frankford and St. Joan of Arc in Harrowgate also merged with Holy Innocents Parish. Ascension Parish merged the year before. Yes, you are correct, that’s quite a few churches. These mergers left Frankford without a Catholic Church. St. Joachim’s beginnings date back to 1843. No Catholic Church in Frankford. I have been blessed with many gifts from the Lord. Humility is one I really have to work at and, if you know me, you understand that. But God has certainly humbled me over these past two years – every time we need to demonstrate the level of faith that the members of St. Joachim Parish and Mater Dolorosa Parish still have, I am in awe. Saturday was another occasion when I felt so grateful for those who continue to support and believe that Frankford needs and deserves a Catholic Church. St. Joachim and St. Ann are the patron saints of grandparents. Father Thomas Higgins, Pastor of Holy Innocents, had our grandparents stand during Mass and gave them a blessing. St. Joachim also accomplished and delivered a surprise gift. At the end of Mass, over 100 people were in attendance, he offered to “continue the conversation” after we had our pretzels and water ice outside, supplied of course, by Keep the Faith in Frankford. We would have had even more people at Mass but we knew the air conditioning was not working. Relive our celebration of St. Joachim and our community with us. At this point, 20-25 people returned to talk with Father Higgins. I admired his willingness to listen to the frustration and pain of the people since St. Joachim closed. This was never about a building; our efforts were aimed at the Archdiocese whom we felt abandoned Frankford and we would not allow that to happen. Father wanted to talk about how we could be a more active part of Holy Innocents. He started out by telling us that Joyce Evans of Fox 29 here in Philadelphia interviewed him for a piece next month. He said if he could fill Holy Innocents, he would think about what he could do for us/other worship sites? Are the two priests of the House of Mercy in Kensington assigned to Holy Innocents? They will be going to assist in other parishes saying Masses. Since they have to say Masses why can’t they come here to Frankford who has nothing? We rehashed the PPA process and the flaws, etc. Why is it that whenever the laity ask questions, we are labeled as “disloyal Catholics”? Reasons why Father can’t give us a Mass – maybe down to 2 priests in 9 months? 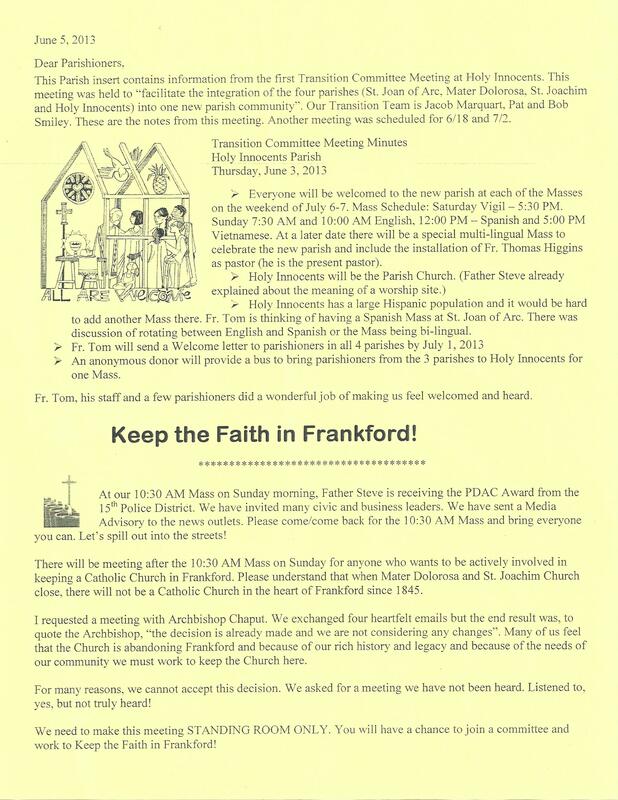 Did they know we were planning a future action at Holy Innocent by distributing information to their parishioners why we can’t abandon Frankford? It was obvious he wanted our passion and energy but what is he willing to give in return? Many reasons, still, why we can’t have something in Frankford. Not yet a discussion on how to make it happen. We’ll have to see if this “conversation” bears any fruit. Again, Father Higgins, we bless you for being willing to be humble yourself, too. 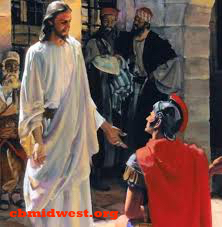 Luke 14:11 tells us all, “Whoever exalts himself shall be humbled and whoever humbles himself shall be exalted”. Has Archbishop Chaput Been “Partial” to Some of Us in the Archdiocese? For almost 2 years, we have been asking this question and no one from the Archdiocese will meet with us or talk to us. Unless efforts are made to review and reverse some of the 46 church closings in the last three years, we would have to answer a resounding “Yes” to that question. 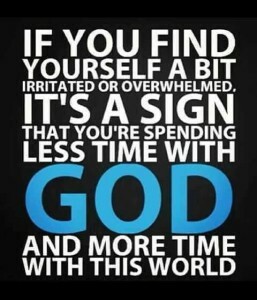 To learn more of the reasons why we feel this way, please take the time to read a recent post, “Our God of Suprises”. Organized by Keep the Faith in Frankford and Philly Catholics, please join us as we ask for the Parish Pastoral Planning Process to be redone! For more info, please call Pat Smiley, 215.520.5616. Thank you and God bless you! Come and ask for the many gifts of the Holy Spirit! 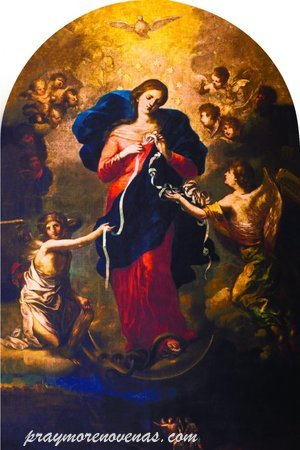 Mary, Help Us To Undo Our Knots! We know that all change must start with ourselves. Prayer creates change. May is a month when we think of our Blessed Mother, Mary! Starting May 1st, we are “kicking off” a month long event dedicated to our Blessed Mother knowing that all we ask will be granted through her intercession. Mary is locked behind the gates of St. Joachim but we are closer to her than ever. Pope Francis has a special devotion to “Mary, Undoer of Knots” and we will ask her to help us “Undo Our Knots”. Let us ask Mary to help us change those things in our lives that need changing and allow us to inspire others with our devotion. Please say a rosary every day and then visit our form to add your name and the number of rosaries you’ve said. Anyone who says at least 20 rosaries during this month and records it on our form, will receive a holy card and a card listing the 15 Promises for those who recite the Rosary (see below). Once you say your 20 rosaries, please email me at patsmiley@keepthefaithinfrankford.org with your mailing address and we will send you your gifts. Perhaps it has been a while since you’ve prayed the Rosary. 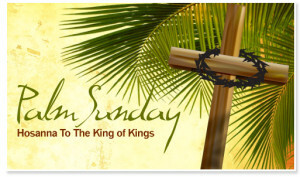 Please check out this link about how to pray the Rosary and what mysteries are said on what day. 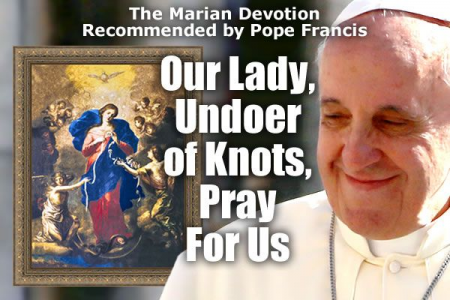 You may want to also read about Pope Francis and his devotion to Mary, Undoer of Knots. Here is the form where you will enter your name, the date and the number of rosaries you’ve said on that day. Scroll down and click “Submit” to record your responses. God bless you and God bless us all!